Indoor air quality in homes is something that affects all of us. Indoor air quality in homes is affected by VOCs and other pollutants and plants can be part of the solution. How clean is the very air that you breathe in your house? Indoor air quality in homes is the subject. The quality of your home’s air. We tend to take for granted that what we breathe is just fine. That is, unless a family member has asthma or some other respiratory affliction. Some things you can see, like the dust particles that you may notice floating in a bright ray of sunlight inside your house. Amazing how much dust there is just drifting around in your air, right? Well, indoor air quality in homes doesn’t stop there. There are many, much smaller things in your air and this article focuses on some of the things green architects can do to help you. There are also some of our GREENTIPS that you can use yourself. One of the issues deals with some downright nasty gases and other elements in our air, from the off-gassing of carpets, paints, vehicular exhaust and other sources and a very simple solution to deal with those, based upon some hard-core research from University scientists. (C)Copyright 2010 Rand Soellner, All Rights Reserved Worldwide. Anyone is hereby licensed to copy this article in its entirety, including all copyright notices, for informational purposes, anywhere, including websites, newspapers, magazines, Wikipedia and other places. Indoor air quality in homes due to pollutants and a solution: house plants. University of Georgia and other scientists have recently conducted exhaustive testing of a variety of plants and their abilities to convert pollutants that are harmful to humans into elements beneficial to people. This is a real step forward for indoor air quality in homes. Dong Sik Yang, Svoboda V. Pennisi and Stanley J. Kays from the Department of Horticulture, University of Georgia, along with Ki-Cheol Son, Department of Environmental Science, Konkuk University, Seoul Korea have conducted rigorous scientific experiments to determine the effectiveness of certain plants at removing harmful indoor air pollutants and converting them into beneficial gases for better indoor air quality in homes. 28 ornamental plant species popularly used by homeowners for indoor plantscaping were tested. A variety of VOCs (Volatile Organic Compounds) were tested: aromatic hydrocarbons (toluene and benzene), octane, TCE, and terpene. The plants were placed into gas-tight glass jars and exposed to the gases, one at a time. After 6 hours (for each gas), air samples were taken from inside the glass jars and analyzed with gas chromatograph – mass spectroscopy, which allowed the scientists to determine each plant’s ability to remove the harmful gas over time. This resulted in a removal efficiency, based on leaf area for each of the VOCs tested. 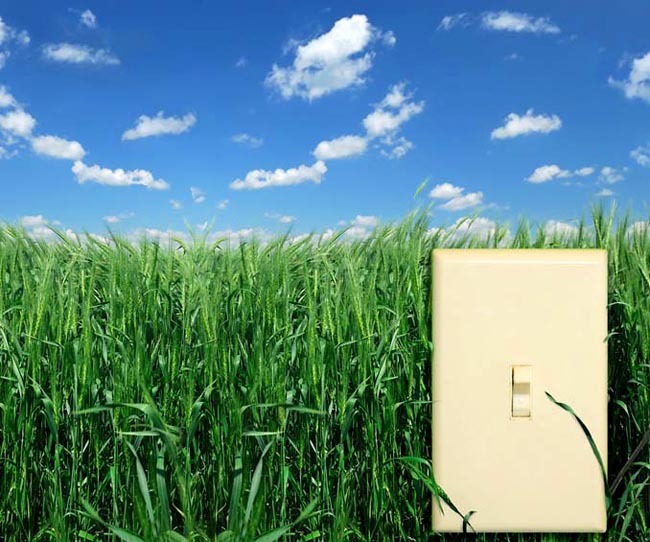 The scientists discovered that each plant’s ability to remove particular VOCs varied by species. The top 8 plants to help clean indoor air quality in homes. Tradescantia pallida (purple heart plant) had the best removal rate for 4 of the 5 VOCs (toluene, benzene, TCE, terpene). 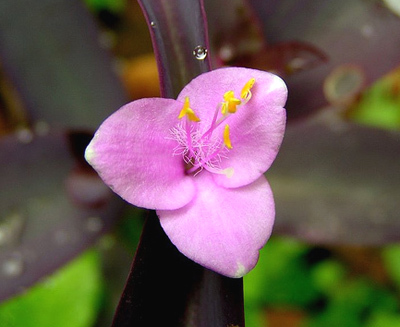 Trandescantia pallida (purple heart plant) helps indoor air quality in homes. Image courtesy of Wikipedia and Lisa Poisso. Each of the plants tested had a different removal rate, from 26.08 to 44.04 µg·m–3·m–2·h–1 . Another plant, Fittonia argyroneura, most efficiently handled TCE, toulene and benzene. The ever popular Ficus benjamina efficiently handled octane and terpene. Polyscias fruticosa handled octane well. The conclusion of the scientists conducting the study was that a combination of these plants will most effectively improve the indoor air quality in homes. If possible, it would be most appropriate to place those plants most effective at dealing with certain VOCs in those areas where those pollutants are know to exist. Interior plantscaping can assist green architects with indoor air quality in homes that they design. Knowing the facts of this scientific report can assist green home architects in their desire to improve the indoor air quality in homes they design. On their floor plans, green home architects can indicate where certain sizes and types of plants should be placed. Armed with actual scientific data about indoor air quality in homes is a major step forward. Probably all of us just assumed that having some plants around in your home was a good idea. Now we know for sure and we know what plants handle what pollutants best. Construction practices and HVAC commissioning is crucial for indoor air quality in homes. 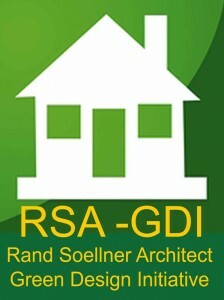 Indoor air quality in homes is one aspect of Rand Soellner Architect's Green Design Initiative. Green home architects specifying healthy home design features like special air filtration systems for indoor air quality in homes. Rand Soellner Architect specifies optional electronic air filters that “zap” dust particles in the air stream, so that the air in the “lungs” of your home is as pure as possible within the reasonable ability of today’s residential air filtration systems. This architect has also found that if a client does not want to invest in the electronic filter, a fallback less expensive choice is simply a better filter, such as the higher-efficiency 1250 MPR (Micro Particle Performance rating) filters which do a better job than the cheapest options. Indoor air quality in homes is affected by many things, and green architects can do much about these, in combination with a willing homeowner who wants a healthier indoor air, and the contractor. In summary, there is a lot you and your green architect can do to improve the indoor air quality in homes. You, as the homeowner are the main focus. You have to decide to invest in materials, systems, and decorating touches that improve the indoor air quality in your home. In doing so, you will be giving permission to your green architect and your builder to help you have cleaner indoor air. Social media tags: indoor air quality in homes, green architects, green home architects, timber frame, post and beam, healthy home design, eco-friendly architect, green design initiative, mountain home architect, cashiers nc, highlands nc, lake toxaway, atlanta, macon, asheville, charlotte, denver, las vegas, lake tahoe, san antonio, aspen, jackson hole. (1) Published in HortScience 44: 1377-1381 (2009), by the American Society for Horticultural Science. (2) Lisa Poisso, Best Air-Scrubbing Houseplants, SuperEco 1/6/2009. Lisa’s article was the inspiration for this one and it is her common-language identification of the plant species. Also, it was her idea to feature the Wikipedia photo of the purple heart plant. 1. What is the main conclusion of this education module about Indoor Air Quality in Homes? a. That it is a wise practice to leave your vehicle running in your garage with the door open between the garage and the living area of your home. b. That people really enjoy seeing plants in their homes. c. That indoor houseplants can significantly improve the cleanliness of the air inside your home. a. Use cheap paper filters that trap mold and mildew near your air handlers. b. Specify electronic air filters that zap dust particles out of the air stream. c. Use of high-efficiency 1250 MPR (Micro Particle Performance rating) filters. 3. What are some of the common names for some of the houseplants found to be effective in the above study? then click here: Sustainable Home Design to go to the next level 20. 1. c., 2. b.+c., 3. d.